Despite being surrounded by modern commercial properties and in the shadow of nearby high-rise office buildings to the west, La Hacienda retains a high level of its early to mid-20th Century architectural character, and remains one of Phoenix’s small, yet prestigious residential neighborhoods. The overall character of the district is emphasized by mature, dense plantings of trees which line the streets. There is a wide variety of mature vegetation including palms, eucalyptus, citrus, mesquite, and pine trees. In the Mayfair section, between 3rd and 5th Streets, these trees sit in a buffer of landscaping in the right-of-way between the sidewalks and the paved streets. In the La Hacienda section, between 5th and 7th Streets, lawns extend directly out to the paved streets without sidewalks. In the historic period, both neighborhoods touted their paved streets as a modern convenience to the suburban driver. Retaining a high level of integrity in architecture and setting, the La Hacienda neighborhood appears today much as it did in the years preceding and following World War II. While some of the neighborhood’s houses have undergone alterations, primarily additions, window replacements, and roofing substitutions, the majority are little changed from the time of their construction, and several are virtually unaltered. Where additions have occurred, they are mainly in the backyards and have little effect on the streetscape of the historic district. Pedestrian sidewalks and streetlights were notably absent from the La Hacienda neighborhood. The lack of sidewalks and streetlights helped to reinforce the exclusive nature of La Hacienda and was a clear sign of the importance that the automobile already had in the lives of Phoenix residents. As these brief biographical sketches indicate, many of the residents of the La Hacienda neighborhood contributed a great deal to their community and Arizona over the years. There can be no question that the neighborhood benefited greatly from their presence over the years. These history makers shared many values and ideals in common and such feelings have a great impact on the shape and quality of a community, and on the City of Phoenix and the State of Arizona. The fact that the La Hacienda and Mayfair subdivisions merged to form a common identity is strong evidence for a shared sense of community and beliefs. The efforts over the years of Janet Beauchamp, Jane Roper, Ruth Reinhold, and Grace Switzer to compile historical information on the neighborhood is proof of a strong sense of history and community by many residents of La Hacienda (Table 2). 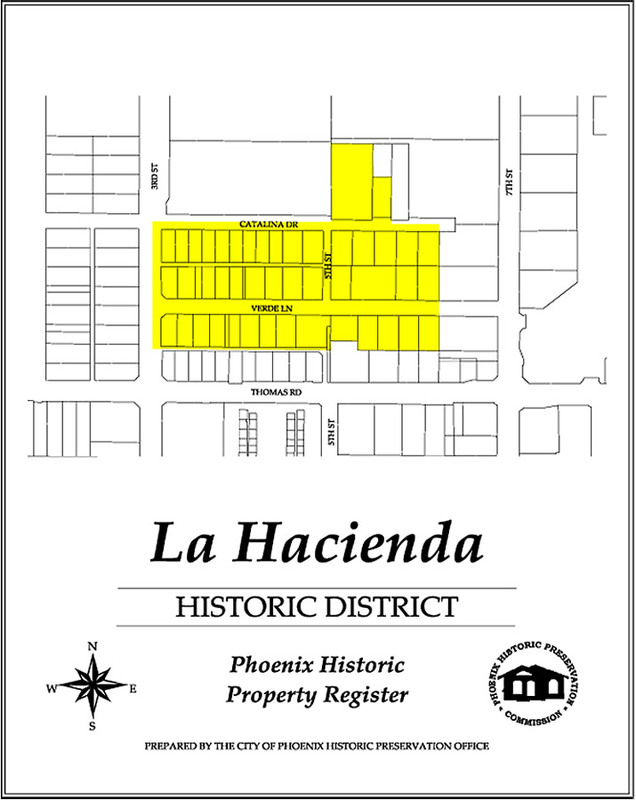 This brief history of the people who lived in the La Hacienda neighborhood provides a sense of the magnitude and significance of the impact these residents had on the City of Phoenix before the 1960′s; the neighborhood’s most critical period of growth and when its community identity emerged. The La Hacienda neighborhood is truly one community with a significant and vital architectural and social history within the City of Phoenix.